http://www.historictamaracklodge.com/wp-content/uploads/2016/03/Antelope-Living-Room-Edited.jpg 1944 2592 WheelieTamTam16 http://www.historictamaracklodge.com.php56-19.dfw3-1.websitetestlink.com/wp-content/uploads/2016/02/Tamarack-1-BLACK-300x234.png WheelieTamTam162016-04-10 14:52:222016-04-10 14:52:22Antelope Cabin Redesign! Modern buildings constructed with historic flair, the Couple Cabins back up against the Flathead National Forest in a secluded wooded haven perfect for contemplative solitude or a romantic retreat. While the snow falls outside, snuggle up inside with a cup of hot chocolate, or head to the slopes in nearby Whitefish Mountain Resort, with a cozy cabin to return to after a day at the mountain. With our property just a short drive from the west entrance of Glacier National Park, it’s a quick jaunt to cross country ski trails and snowshoeing galore. Ask our friendly front desk staff for information on in-house snowshoe rentals and trail recommendations! A short stroll beyond our back fence, the beaver pond in the Bob Marshall Wilderness gives guests a taste of winter wonderland when the the water freezes over and snow dusts the treetops, with the hills rising up behind in a vista of snow-sprinkled wilderness. For guests with reduced mobility, the Merritt Cabin offers ADA-approved bath design with full roll-in wheelchair access, and both cabins feature parking directly in front with no steps or stairs. The intimate interior offers hardwood floors and lofted ceilings, alongside a full kitchen and bath in the studio-style cabin that lends an intimate feel. Just down the path in the main lodge building, guests can enjoy the warmth and cozy of the common room, with overstuffed leather couches to curl up on in front of the fireplace. Reserve a Couple Cabin at the Historic Tamarack Lodge & Cabins for an intimate mountain getaway this winter! You came, you saw…and then you had to go. But don’t worry, northwestern Montana is waiting anxiously for your return. Until then, stay connected to the area with these three ways to live a little longer in Glacier, if only through your computer screen. The next best thing to seeing the park in person, the Park Service webcams cover eight scenic views, from Apgar Village to Many Glacier and Two Med. See wildlife and mind-shattering sunsets in real time from your computer at home. Warning: regular exposure to Crown of the Continent beauty is sure to inspire a return visit. Between Facebook, Flickr and everything in between, it’s easy to stay connected to your favorite Glacier spots. Not to toot our own horn, (but of course we will!) the Tamarack social media comes with travel-inspiring photos straight from the lodge and Glacier Country. Follow us here (and here and here) to see more! 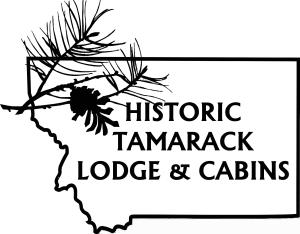 Sign up for our Tamarack newsletter and get an inside look at what’s going on at the lodge, complete with guest stories, rollicking local tidbits, contests, and more.